This room seats up to 40 people. 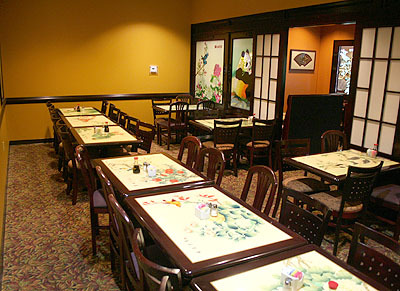 Reservations for large group meeting, functions or dining are accepted. Please call in advance to reserve large group dining table(s) or room. We have three private dining rooms available accommodating from 20,40 or 60 people. Each room could have total privacy for conducting business meeting or any functions at your discretion. Please provide first and last name, contact number(s), date of function, and number of person attending. The availability of the private rooms is subject to our private rooms bookings, the day and the time of the reservations and management discretion. Please call 270.759.4653 for large group dining or reservations.